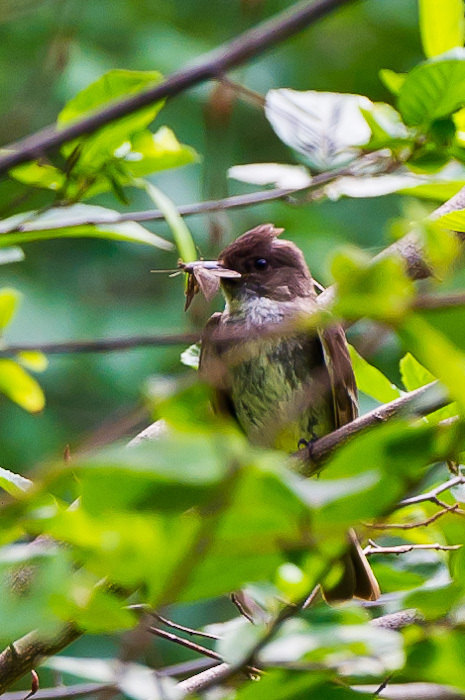 The Eastern Phoebes are looking a bit tattered these days as their chicks are now hatched and well established in the nest under our deck. The adults are constantly swooping through the backyard, chasing and catching insects and taking them back to the nestlings. I was a bit concerned this week when I mowed the lawn in between the two decks, thinking I was going to disturb them. But, at one point when I looked back, I saw a Phoebe not far behind me, following the freshly cut swath of grass and easily capturing a moth I’d disturbed. Maybe these flighty little birds really aren’t as timid as I’d thought.